The TGV was demonstrated at HAPTICS SYMPOSIUM 2010 in Waltham, MA (Boston Area) and received some honorable mention in IEEE Spectrum and WIRED. The article in Penn Gazette gives a very good user response of the vest. TGV is a haptic feedback device designed to increase the immersiveness of first- and third-person shooter games. The vest includes a multitude of solenoids, eccentric-mass motors, and Peltier elements controlled by custom electronics and a personal computer. 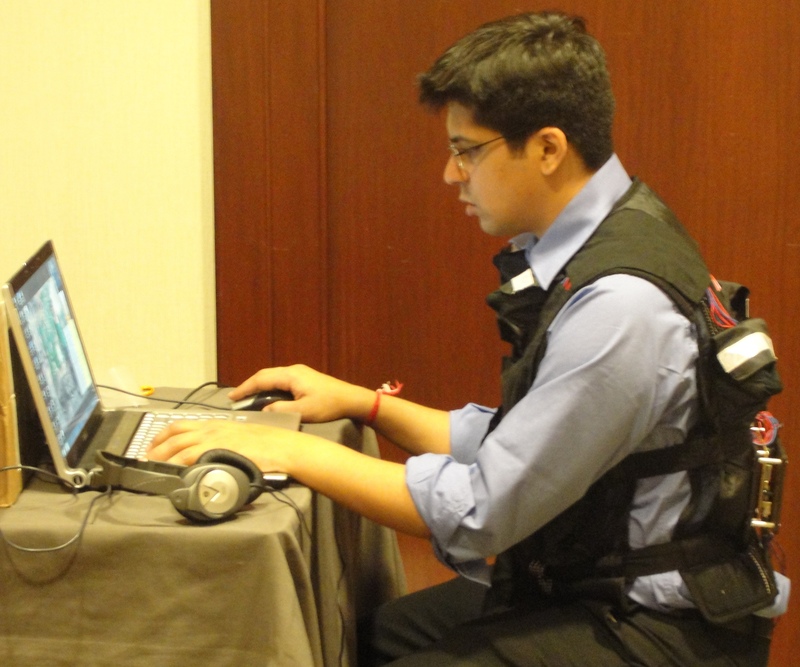 When the player’s character experiences injury in the game, the vest simulates the appropriate sensation (bullet hit, vibration, and/or heat) in the correct location on the player’s body. Beyond shooter games, we believe similar systems could be used to enhance laser tag, military training, movie watching, and other games.